We’ve all been there. You scrub & scrub your stove but that tiny little stuck-on piece is being stubborn. You scratch at it with your fingernail to dry to dislodge it. But since your hands have been in the water, those fingernails don’t have the same ooomph as when they’re dry. So you continue to scrub instead. But I’m all for not spending more time cleaning that necessary. And sometimes the easiest solution to a problem is also the simplest. 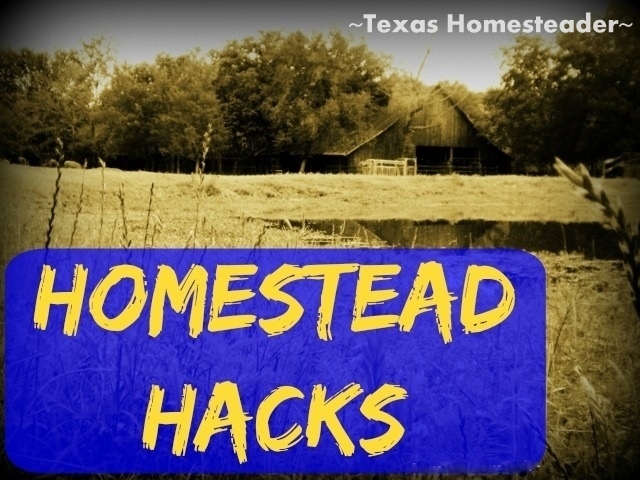 Check out this handy Homestead Hack. Use Whatcha Got! So as I mentioned I was cleaning my stove. That little splat just wouldn’t come off easily with my soapy rag. I tried to use my fingernail to dislodge the spec but it was close enough to the heat source that it was baked-on hard. 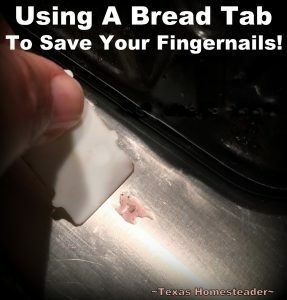 It’s a bread tab to the rescue! You see, I keep a bread tab in my utility drawer in my kitchen to use for cleaning. I pulled it out and used it in place of my fingernail. The rigid plastic had more scrubbing power than my fingernail did. And BOOM! I’ve used it for various other fingernail-scratching kitchen cleaning as well. Then I just finish wiping down the surface, clean off my bread tab and place it back in the utility drawer. It’s ready & waiting for the next time it’ll be needed. This entry was posted in Blog Posts and tagged Cooking, Environment, Frugality, Homestead Hacks on December 13, 2017 by Texas Homesteader. BRILLANT!! I just took one out of the recycling bin!! Keep em coming……. Love your bread tab idea! When cleaning the stove I’ve been known to use a knife, not the safest and yep it scratches the finish, so definitely going to give this a go.